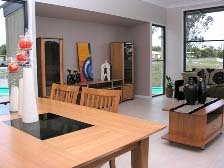 Ausmar Homes has built the "Sustainable House" for the Hervey Bay City Council. This house is being used as a model for the area and the rest of South East Queensland to practically demonstrate and promote the benefits of environmentally, socially and economically sustainable housing. It's situated at Lakeside Place, 145-147 Old Maryborough Rd, Hervey Bay.